Fresh off the press, printed and bound it gets delivered to your organization ready to be read and digested. But what actually goes into the making of these ‘Annual Reports’? We’ve been through a fair share of meltdowns and hard-pressed deadlines to have a few handy lessons to keep in mind when we design them! There are considerations to be made when conceptualising an idea for a report. Things like what is the existing branding? What are the colours notable to said corporate identity? Are there existing brand guidelines to refer to? To what extent would you be willing to change it up? In order to cater the annual report to a client we ask ourselves a multitude of questions and sieve out our ideas and concepts to make sure that we come up with concepts that will present well. 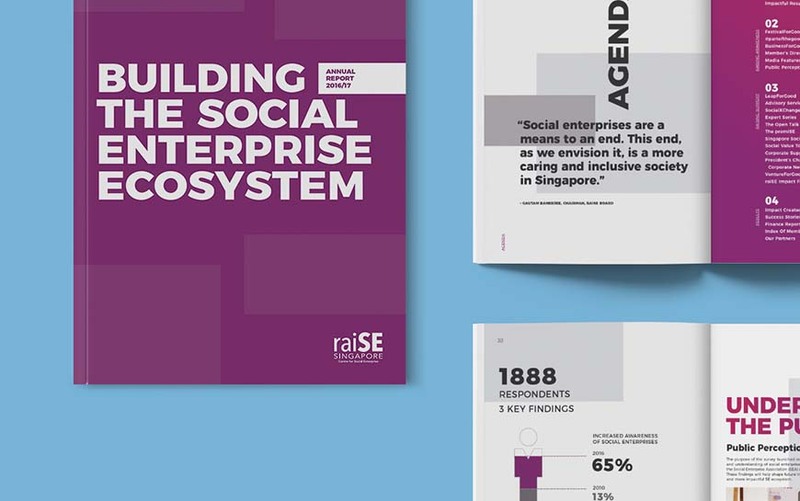 When we got started on designing the raISE annual report for example, we did it with a refreshed brand look and feel – making something geometric with a play on fonts and imagery while still looking trendy and relatable. We wanted the statistics to really stand out. And the thing is, without a clear direction on where you want the report to go, things can get really messy, really quickly. Lesson 1 – always set-up a clear design and content direction before starting to dive into things. Lesson 2 – Bring in something unique, that will make that report unmistakably you. You don’t want to be just another annual report. Printing specifications, papers and techniques are always a big discussion. The AWWA annual report for example comprises of two items, an annual report and a separate financial booklet, both bound together by a bellyband. It seems to become a growing trend to keep these two books separated, as it allows people to drive right into whichever segment of information that speaks more to them, while keeping things nice and tidy. 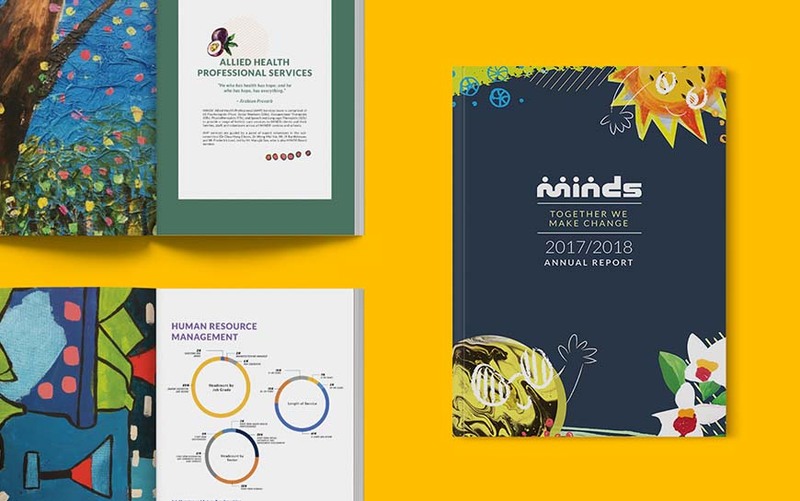 The annual report itself could be used as a presentation brochure to showcase the variety of services an organisation can offer, and the impact it brings. On the cover of the annual report, we wanted to keep things simple and illustrated, so in order create more of a “wow” first-impression we decided on using a hot stamp effect on the cover, with zero printing, yet we managed to make it fit in the budget as it was discussed beforehand with client and printer. Lesson 3 – Choose the appropriate touches to create wow effect while managing the budget. Oddly enough, when you first pick up a book with “cool” printing effects, you would probably think wow they must have a lot of budget! There probably lies a misconception that the ‘fancier’ your annual report looks, the more expensive it is. Let’s bust some myths here. In most cases where the volume of printing is high, adding an additional embossing/ hot stamping or spot uv on the cover of your annual report will usually not explode your budget. 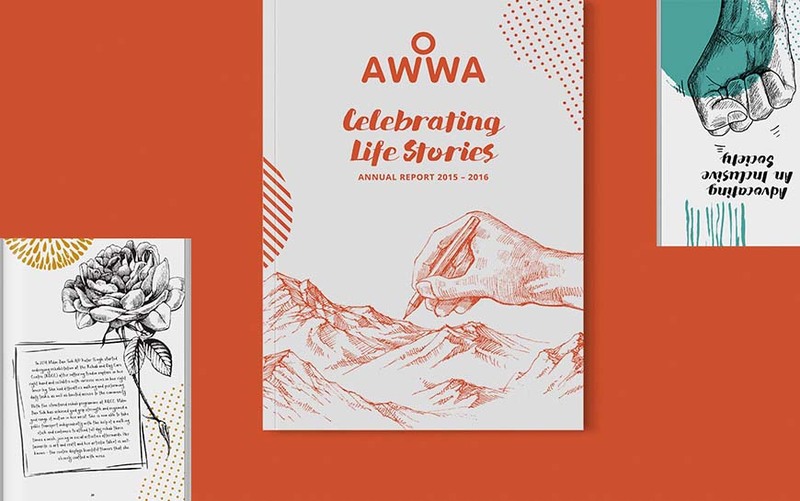 A cover like AWWA’s Annual report, with a full hot stamp effect and no printing, did not cost significantly more than a cover with normal 4C printing. It actually effectively raises interest in the masses who reads your report, while maintaining the budget. Lesson 4 – Always be transparent with your budget and quantities to allow the agency and printer to discuss printing possibilities. Yes, consolidating information for the annual report can be a pretty dull experience. While most annual reports take on a clinical and medical approach (because we’re working with lots of words and lots of numbers), we like to shake things up by constantly pushing for ideas and concepts that break out of the norm. We have also started working on digital annual reports, and it challenges us to still keep things attractive but on a different medium. We are not worried about the lack of special printing effects, as digital platforms allow us to play with movement! Sometimes, if executed well, animated gifs and videos might be easier to digest than flipping through pages! Well, we like keeping things exciting in this part of town! Lesson 5 – Gather your content and be ready to break normality by offering different kinds of storylines. Lesson 6 – Be opened to new formats, this world is decidedly digital.